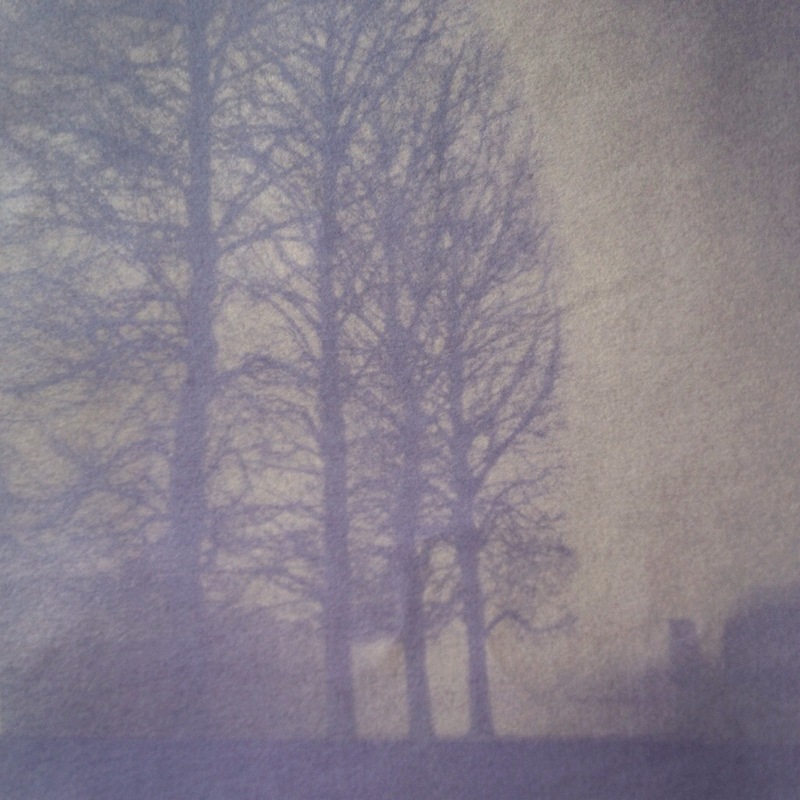 Last November, one of my Anthotypes was included in an exhibition at Lewes Castle museum. 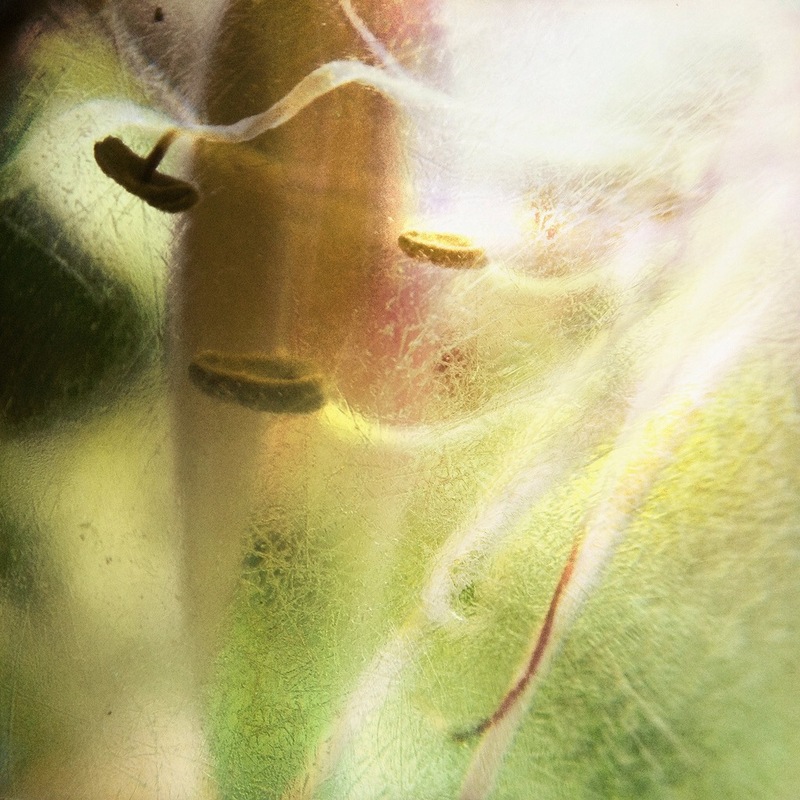 Entitled Captured Light, it featured work by a small group of contemporary artists who use early photographic processes.On this occasion, so that my print would not fade, it was framed with UV reflecting glass. For extra protection, a little felt flap was placed in front that viewers were invited to lift so that they could view the image. 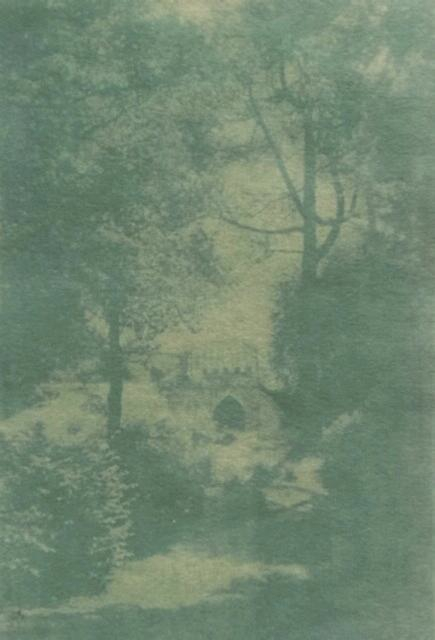 Here’s a photograph of the print: an Anthotype featuring Eagle House at Painswick Rococo Garden. It was made with colour extracted from Purple Alium Flowers grown in the Exedra Garden. In “the flesh” the colour of the print is a deliciously murcurial green-blue. It’s impossible to pin down these beautiful dyes with digital ink! This entry was posted in Uncategorized on February 11, 2015 by lumilyon. Here are a four images from a larger group of my macro work, recently shown in the exhibition Plant Deltas and Plant Macros, at the Brentwood Road Gallery, Romford, alongside work by Karl Blossfeldt, Nigel Henderson and Parisian artist Evelyne Coutas. This entry was posted in Uncategorized on January 29, 2015 by lumilyon. Steve, the head gardener here at Painswick, is happy for me to take as many sweet peas as I like, because the more I pick, the more will grow! Here are three Sweet Pea Anthotypes, exposed outside at Painswick Rococo Garden and in my greenhouse in Cheltenham, Gloucestershire. 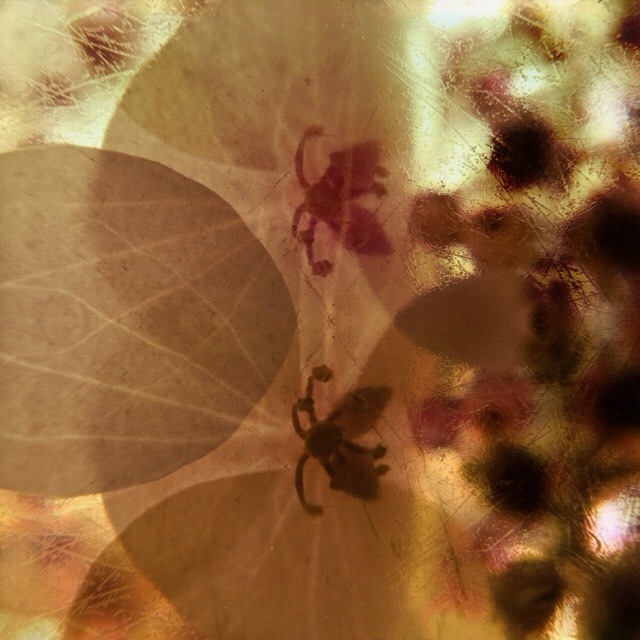 This entry was posted in Uncategorized and tagged Alternative Mobile Photography, Alternative Photographic Processes, anthotype, Anthotypes, English Gardens, Historic Gardens, Historical Photographic Processes, Hortus Lucis, Lumilyon, Mobile Photography, Nettie Edwards, Painswick, Painswick Rococo Garden, Sweet Peas on July 20, 2014 by lumilyon. 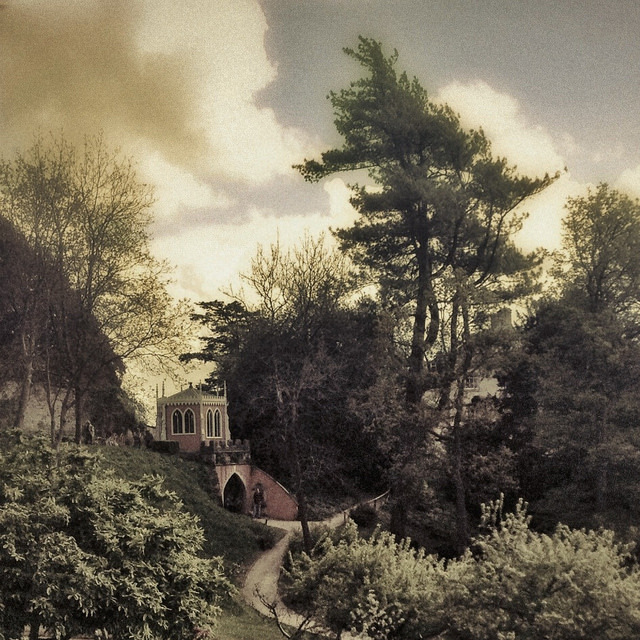 I used to visit Painswick Rococo Garden maybe once or twice each year. Now that I’m here for at least two days a week, seasonal snapshots have been replaced with much more detailed pictures of what’s going on. I have more time to pay attention and I’m noticing just how quickly things change. During my first two months, I’ve watched tulips and Peonies bloom, their petals fade, curl and drop; apple and pear blossom drift across the orchard; dandelion clocks float into the fields beyond. I’ve learned that I must grab the opportunity to experiment with what’s in season, or think carefully about how I use limited supplies. For instance, tulip bulbs are expensive, so it was understandable that Steve, the head gardener at Painswick, was reluctant to part with too many. After all, he and his team nurture them for the enjoyment of visitors rather than to be beheaded in their prime by an inquisitive artist. However, he was able to to offer me a handful of tulips that were growing stray in the Kitchen Garden. 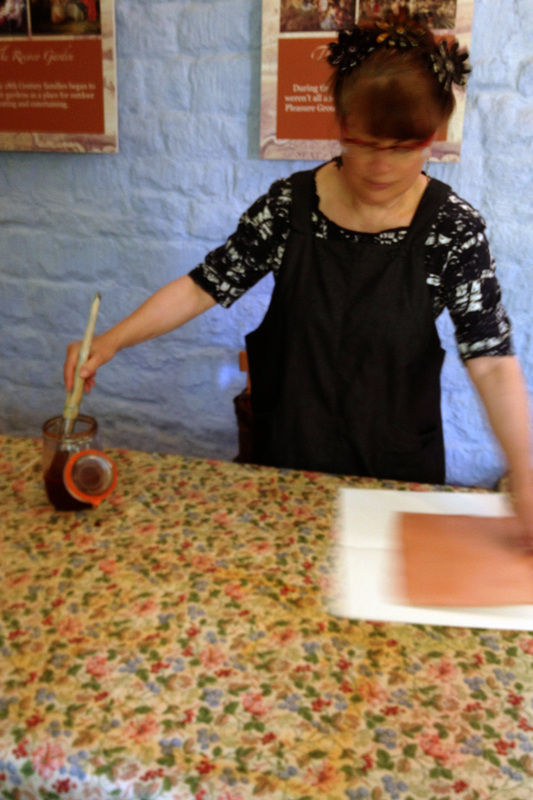 Foolishly, I stretched my sample of tulip dye over too many sheets of paper, so didn’t have enough for a second coat. Hence, the resulting colours are very pale and so of no use for making successful Anthotypes. Now I shall have to wait a whole year before the chance to work with tulips comes around again. 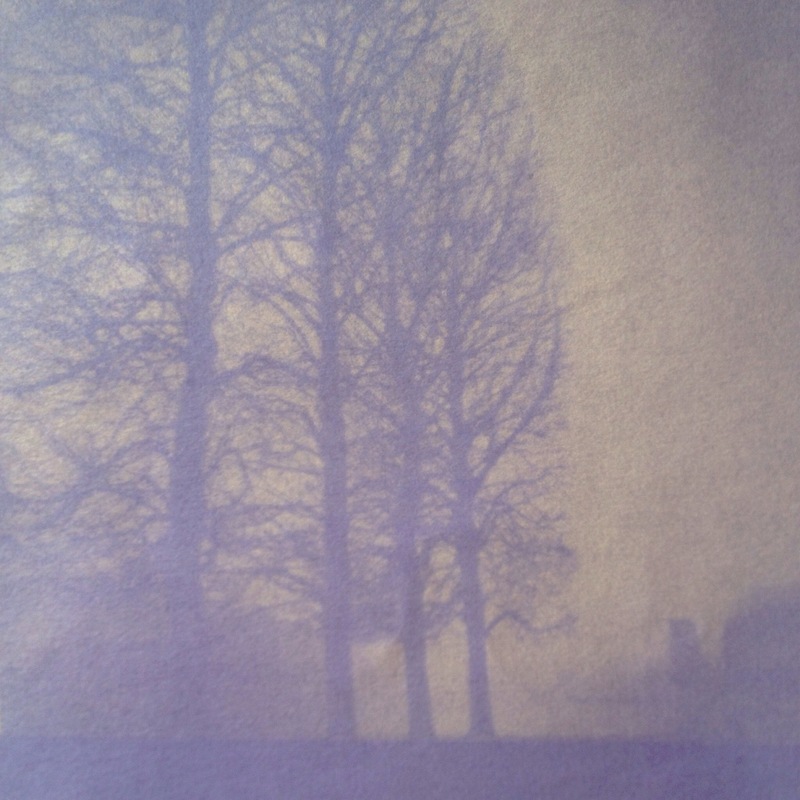 This week’s Tuesday sun shone bright on Painswick, so I decided to begin exposing a sheet of lilac paper. 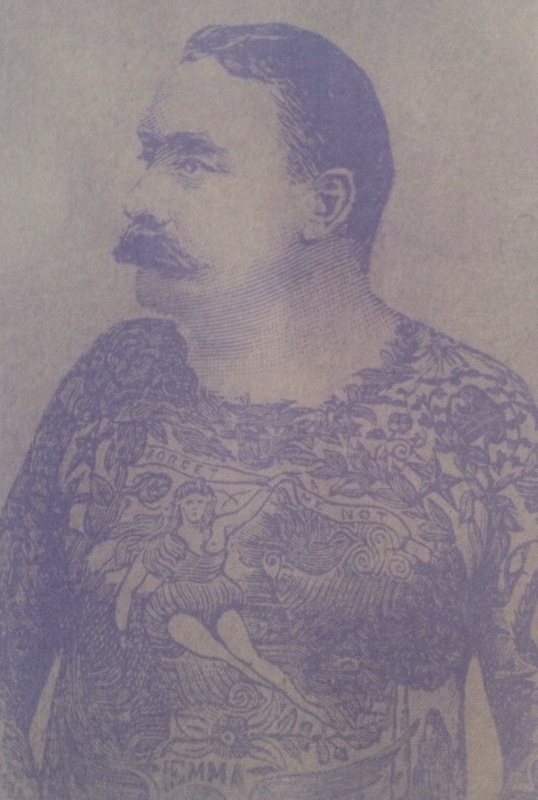 The transparency image is a 19th century etching of a tattooed man. This feels like an appropriate subject for an Anthotype because tattoos are permanent art only for as long as the person whose body they adorn stays alive. Do tattoo artists concern themselves with the thought that their art won’t last forever? When I first conceived this project, my idea was simple: take iPhone photographs of the garden and the produce grown here, then print them as Anthotypes. However, as my research progresses, new possibilities are presenting themselves. Visitors to the garden bring stories to share: memories sparked by the knowledge that my prints won’t be fixed. Musicians and actors have an instinctive understanding of the ephemeral because they too create art “in the moment, for the moment”. Whilst sitting next to the lilac bush, mashing its delicate blooms, I remembered my mother’s love for the music of Ivor Novello. 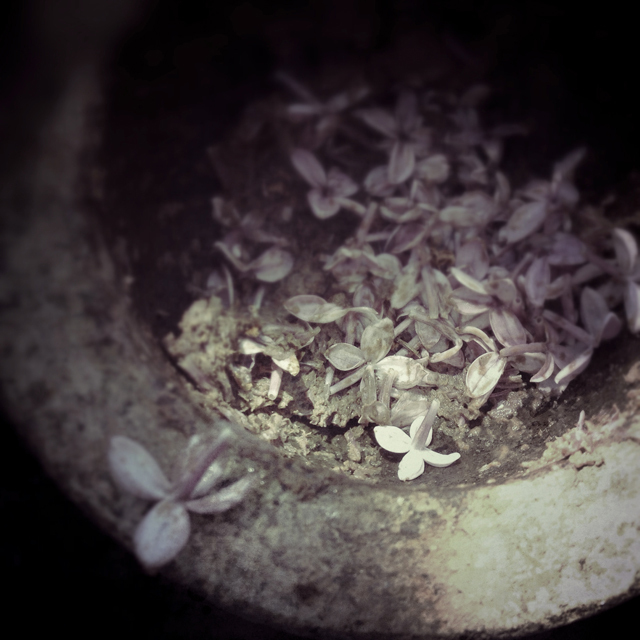 The song We’ll Gather Lilacs In the Spring Again drifted through my mind and mingled with the sounds of the garden: gentle breeze and birdsong. Whilst taking a walk to pick the Lilac flowers, I spotted what looked like a Damselfly hovering just above the ground. The path is shaded by tall trees, so it took a minute of intense concentration before I realised that what I was actually looking at was a lime tree seed, caught and dancing on the breeze. On another occasion, I thought it would be fun to take photographs of the gardening team as they weeded the Exedra garden, but when I got there, my eyes and imagination were captured by raindrops hanging from honeysuckle support wires. I spent over half an hour examining them, but thought it time time well spent because I found the Exedra captured in these tiny, watery lenses. It’s good to slow down and enjoy such moments of discovery: to listen to the stories that this beautiful garden has to share. 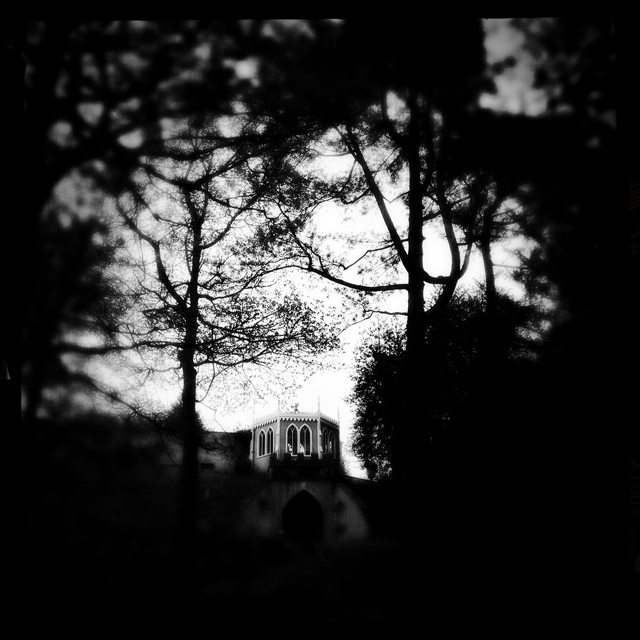 This entry was posted in Blog posts and tagged 18th Century Garden Design, 18th Century Landcape Design, Alternative Photographic Processes, Anthotype Dyes, Anthotypes, Black and White Photography, Colour, Cotswolds Gardens, Cow Parsley, English Historic Gardens, Exedra Garden, Garden Follies, Garden Photography, Gloucestershire Gardens, Hipstamatic, Historic Gardens, Historical Photographic Processes, Image Blender, iPhone ography, iPhone Photography, Ivor Novello, Lilac, Lumilyon, Mindful Photography, Mindfulness and Photography, Mobile Art, Mobile Photography, Nettie Edwards, Painswick, Painswick Rococo Garden, Plant dyes, Pro Camera, Queen Anne's Lace, Rococo, Rococo Garden Design, Snapseed, Tulips, We'll Gather Lilacs In the Spring Again on June 20, 2014 by lumilyon. 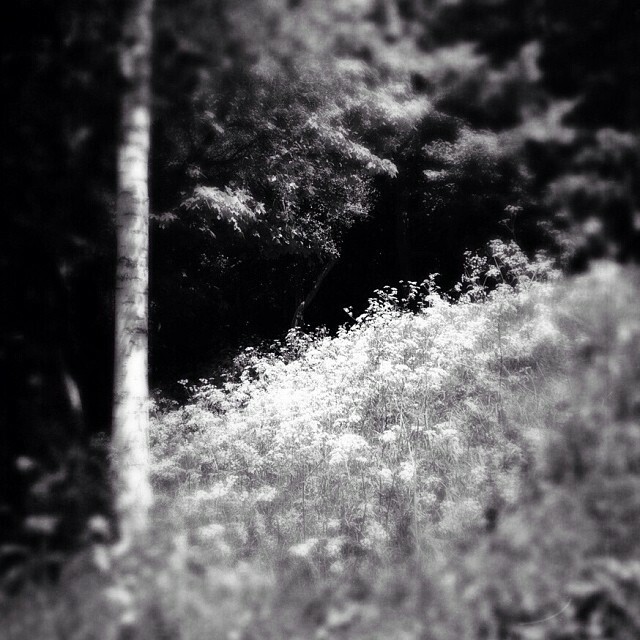 A selection of Black and White Photographs from my May gallery. These photographs explore the darker, more mysterious aspects of the Rococo period, so I call them Rococo Noir. 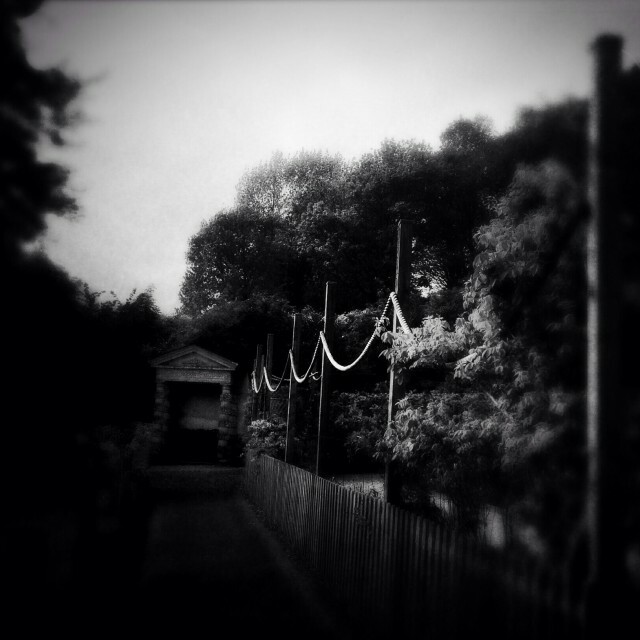 This entry was posted in Photographs and tagged 18th Century Garden Design, Black and White Photography, Cotswolds Gardens, English Gardens, Hipstamatic, Historical Gardens, Hortus Lucis, iPhone Photography, iPhoneography, Lumilyon, Mobile Photography, Nettie Edwards, Painswick Rococo Garden, Rococo on May 31, 2014 by lumilyon. The principals of making Anthotypes are straightforward but, as with most things, there’s a little bit of devil in the detail. What follows is a brief introduction to the process, omitting some of the finer points that will be covered in future posts. 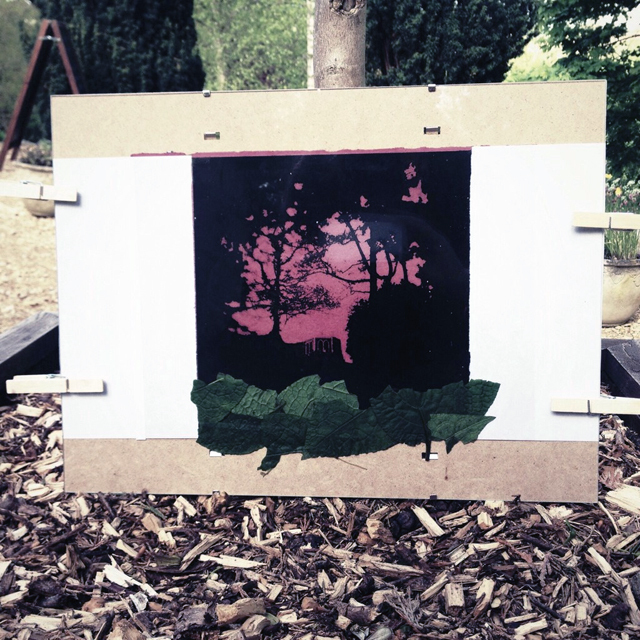 Meanwhile, Malin Fabbri’s wonderful book ANTHOTYPES: Exploring The Darkroom In Your Garden And Make Photographs Using Plants, is THE Bible for all those inspired to try this art for themselves. It’s available to purchase by post or to download from both Amazon and Lulu. Malin Fabbri’s book contains illustrated details of many plants but encourages further experimentation. One word of caution: please remember to check that the plants and flowers you choose are not poisonous. Quite simply, to make an Anthotype you need plant matter and sunlight. Not much of the former, but in most cases, rather a lot of the latter. 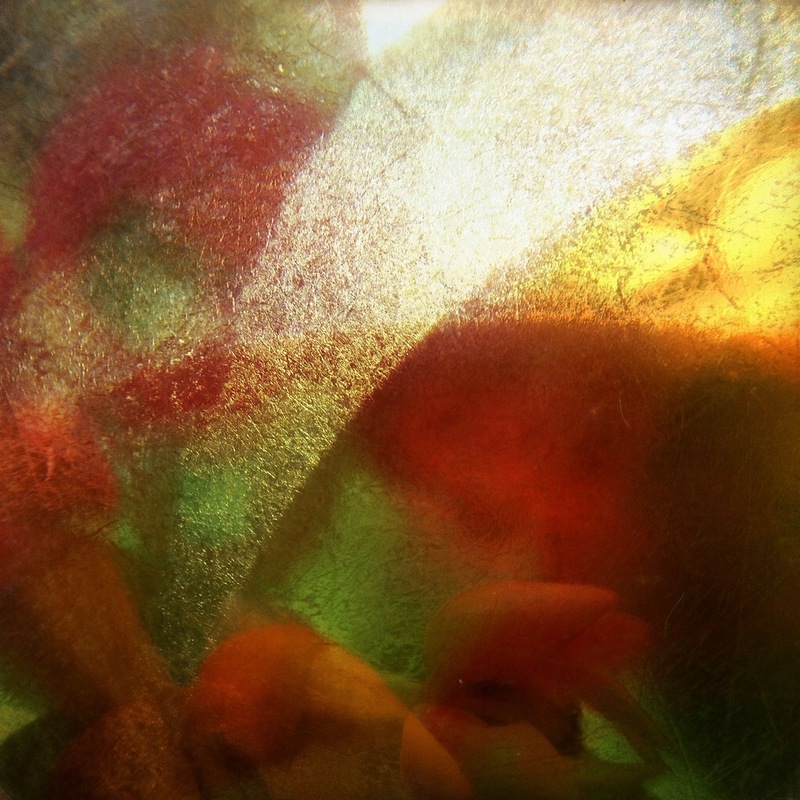 Dye is extracted from the plant matter, paper is coated with the dye, a photographic transparency is placed on top of the dyed paper, both are exposed to UV light which bleaches away areas of the dyed paper, leaving an image. So, the first thing to do is select a few flowers, leaves, fruits or vegetables that look as if they will produce coloured dye. There’s no reason why you shouldn’t buy these from your local supermarket, but since the middle of April, I have been experimenting with some of the wonderful things that are grown here at Painswick Rococo Garden. During my first week, Head Gardener Steve Quinton asked me if I could find a use for some end-of-season beetroot that he was grubbing out whilst preparing a bed for new planting. 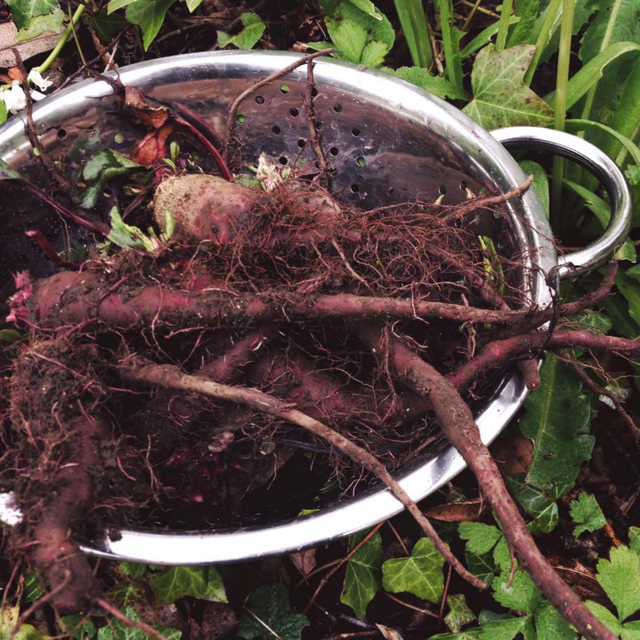 The roots were far too small and woody for the kitchen, but beetroot is one of the most reliable vegetables for making Anthotypes, so I was delighted to save Steve’s offering from the compost tip. Once I’d removed the green leaves, I chopped and washed the red stalks, put them to one side, then scrubbed the knarled roots clean. I was curious to see if the stalks would produce as strong a dye as the roots. The next stage of the process is to pulverize your chosen “ingredient”. This can be done by hand, with a mortar and pestle, or in a liquidiser. 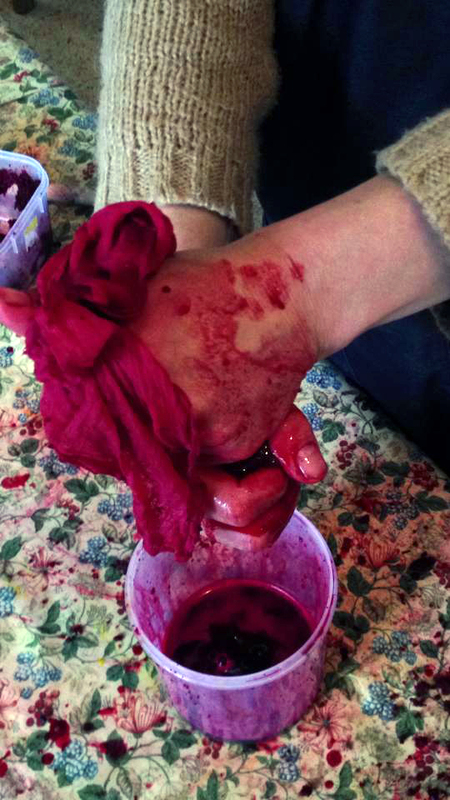 Some things will mash up and release dye very easily, especially if they have been cut into small pieces first, but it’s often necessary to add a few drops of water, alcohol or vinegar. This helps to emulsify the plant matter and relase coloured dye. My raw beetroot was far too tough for either method, so chef Lucy Moir came to the rescue, kindly offering to boil it in a kitchen pan and then blitz it in the liquidiser. Whatever process you employ, the aim is to end up with a thick, soupy/pesto-like consistency. Personally, I prefer to add as little extra liquid as possible so that the resulting dye is not too “thin”, by which I mean translucent. Now comes the really fun bit! To extract dye from the vegetable mash, sieve it through a fine metal sieve or clean muslin cloth. You may need to sieve the mash a second time through a clean muslin: what you’re aiming for is a clean dye with no “juicy bits”. When you’ve squeezed as much juice as you can from the vegetable mash, you’re ready to coat a piece of paper with dye, using a paintbrush or sponge. 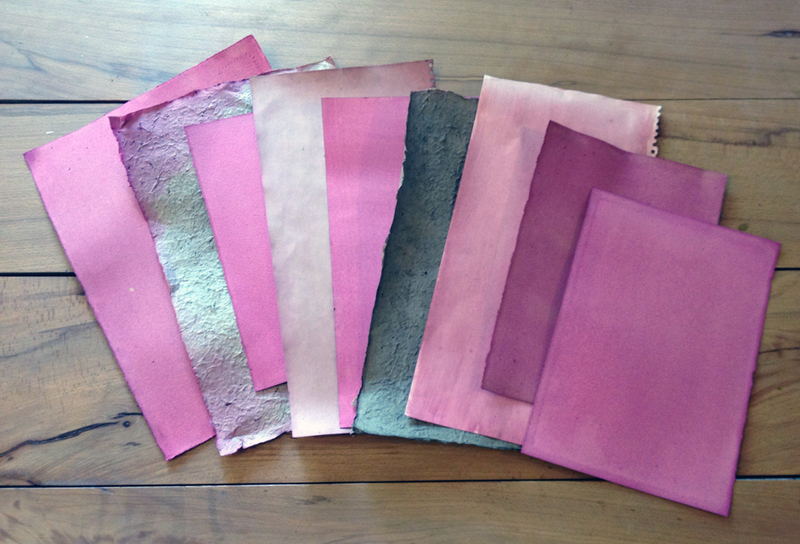 It’s important to choose a paper that will absorb the dye. 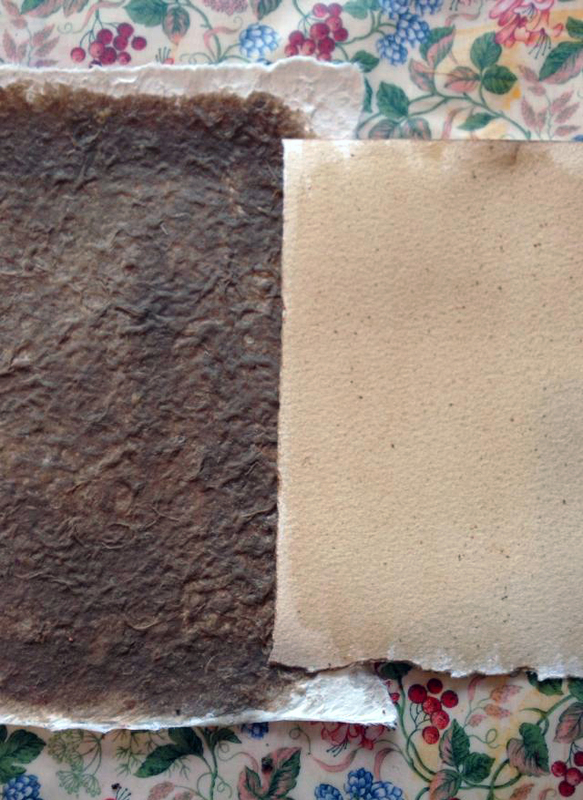 Thin papers are said to work better than thicker ones, but I’m experimenting with everything from heavily textured Napalese Karuki paper, various weights of watercolour and cartridge papers and unidentified scraps scavenged from my studio bookshelves and cupboards. 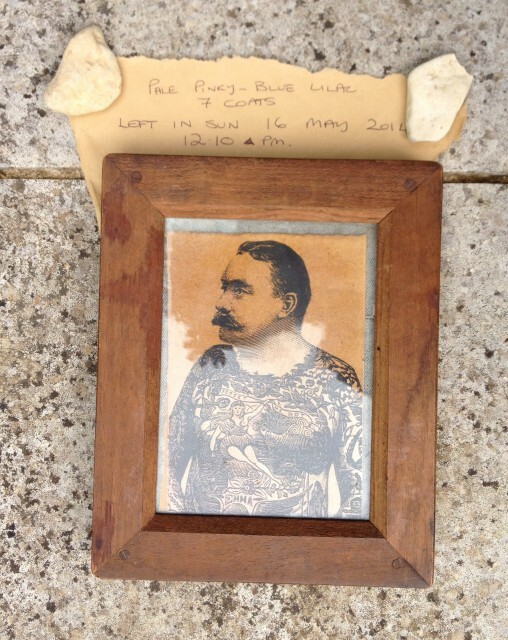 Selecting a photograph with which to make a digital transparency requires careful consideration. It’s important to note the word TRANSPARENCY rather than NEGATIVE. Remember that this is a BLEACHING process. 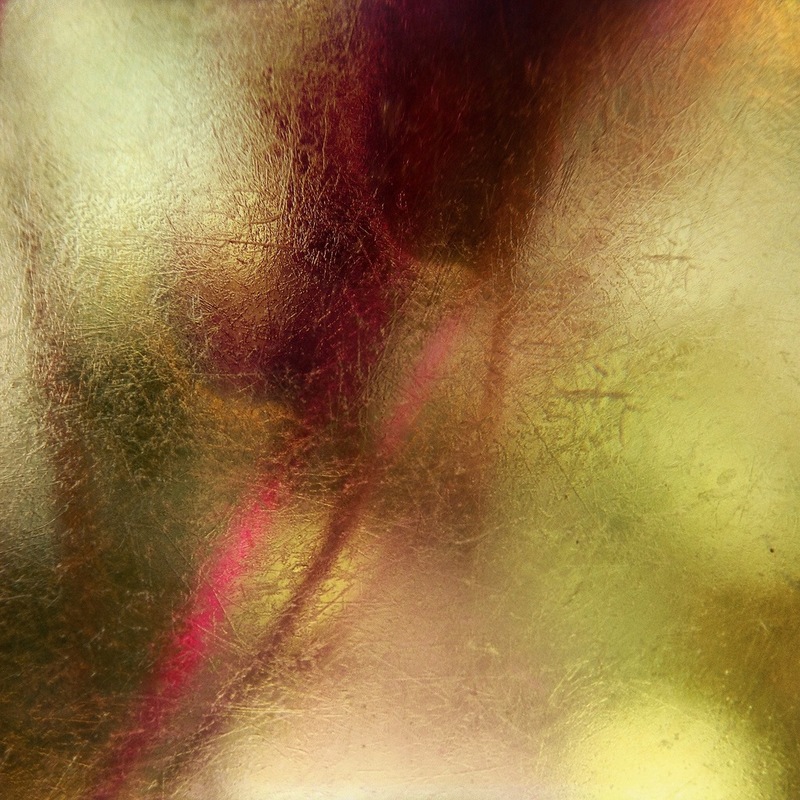 A transparency is copy of a photograph printed on acetate. This may be made on a photocopier, home inkjet printer or office laser printer. Below is the photograph I chose as my first Anthotype, selected it because it’s a high contrast image with very black blacks and white whites. The black areas must be as black as possible so that the sun does not penetrate through them too much. Making a suitable transparency can be a bit tricky and I’ll be sharing some of my trials and errors in future posts. 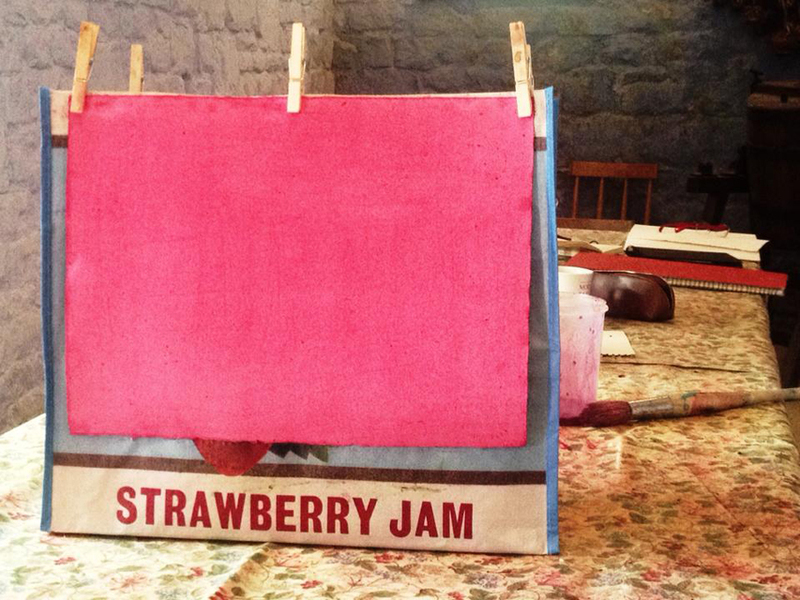 Place a dry transparency on top of piece of the dry, coated paper. Sandwich this inside a glass-fronted frame: a cheap, clip-frame is perfect. You’ll notice a few extra things in the photograph on the right. The paper at each side and the leaves masking the lower edge were used to mask fingerprints on the transparency because I’d handled it too quickly, before it had dried! The leaves were an experiment, to see if the sun penetrated differently. Once you have your prepared the paper, transparency in the frame, wait for a sunny day, place outside in a location where it can soak up as much sun as possible, then wait..and wait…and wait (as you may have already gathered, making Anthotypes requires a lot of patience) The sun will gradually bleach the areas of the paper that are not hidden under the dark areas of the transparency. This may take hours, days, weeks or even months, depending on the plant matter used and where you are in the world. Here in Painswick, we’ve had a few glorious days since mid-April, but they haven’t always coincided with my days in the studio when I could place the frame outside and keep an eye on the weather. 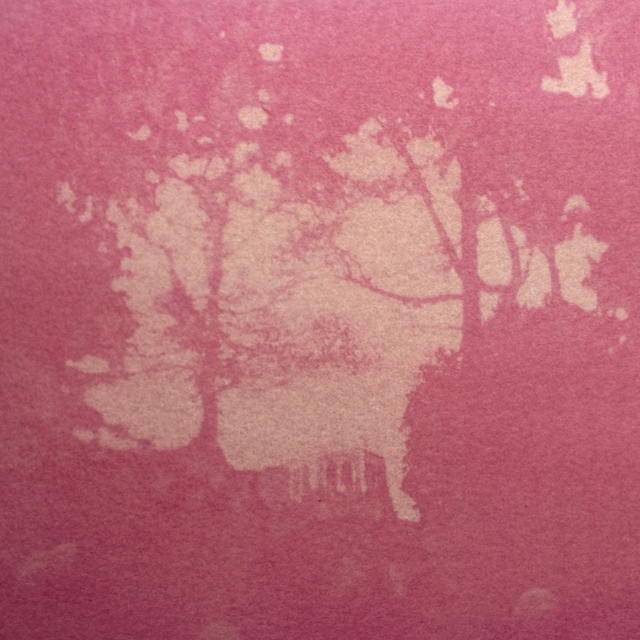 After three days in the sun, my Anthotype was not showing much sign of bleaching. It was then that I devised a cunning plan, in the form of the greenhouse! Feeling rather pleased with myself, I placed the frame on the greenhouse shelving and left it in the company of some tomato plants for about a week. This way, I could optimise the daylight, even on overcast days. Et voila! 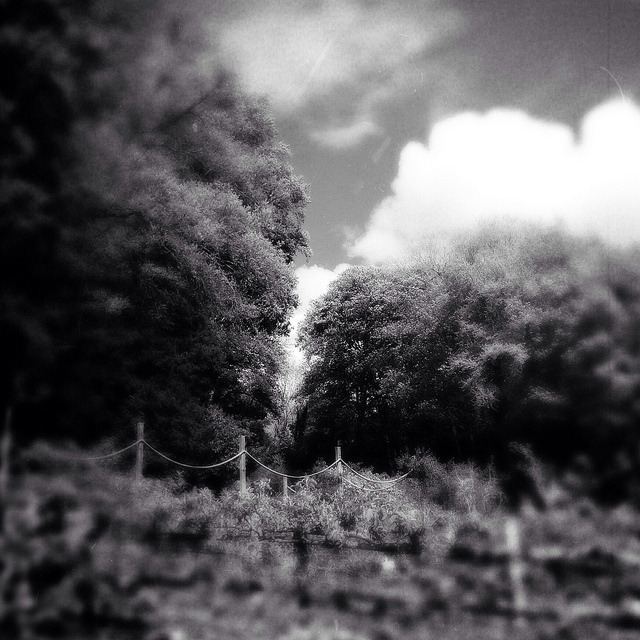 The first Hortus Lucis Painswick Rococo Garden Anthotype and just possibly, the first ever Anthotype made from an iPhone photograph. I’m rather pleased with the result. There is much more detail than I expected: it was an exciting moment to recognise Eagle House in all its ethereal, beetrooty-pink glory! On Monday afternoon, two ladies visited the Bothy to ask me about Anthotypes and I was delighted to finally have an example of my own making to share. I explained that we had to view the photograph in dim light, to preserve it for as long as possible. One of the ladies asked “can’t you vanish it or something, to preserve it?” to which I replied “I don’t want to”, “So how are you going to sell it for millions of pounds?” My second answer was as simple as my first “I won’t”. Over the coming year, this first print will be kept in a drawer at Painswick Rococo Garden and I’ll share it with visitors. 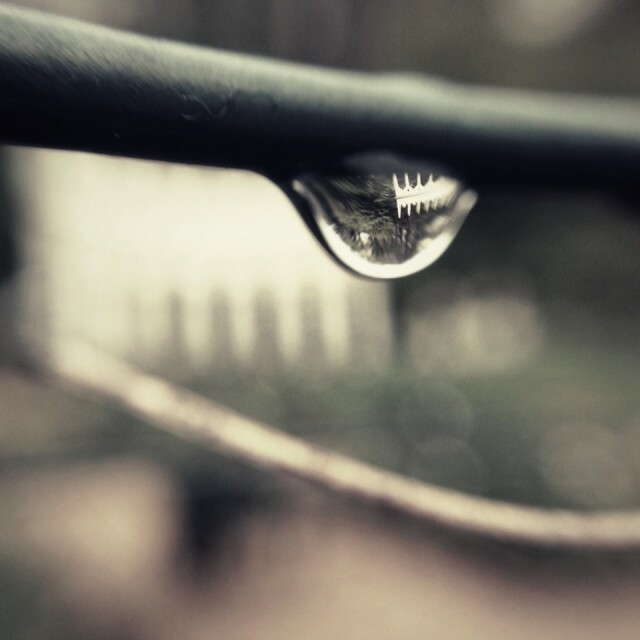 It may take a year to fade, it may take twenty, or it might just still be visible a hundred years from now. But however long it lasts as a visible object, the making of it has given me immense pleasure: I’ve spent a month in the most beautiful garden, made fascinating discoveries about nature, science and art, heard the stories and reflections of those who have stopped by to ask me about the process and finally, experienced the inexplicable pleasure of seeing my first Anthotype appear from under the glass. This entry was posted in Blog posts, Tutorials and tagged Alternative Photographic Processes, Anthotype tutorials, Anthotypes, English Gardens, Garden Photography, Green Photography, Historical Photographic Processes, History of Photography, Hortus Lucis, Lumilyon, Nettie Edwards, Painswick, Painswick Rococo Garden, photograms, Rococo Garden, Rococo Garden Design on May 28, 2014 by lumilyon. 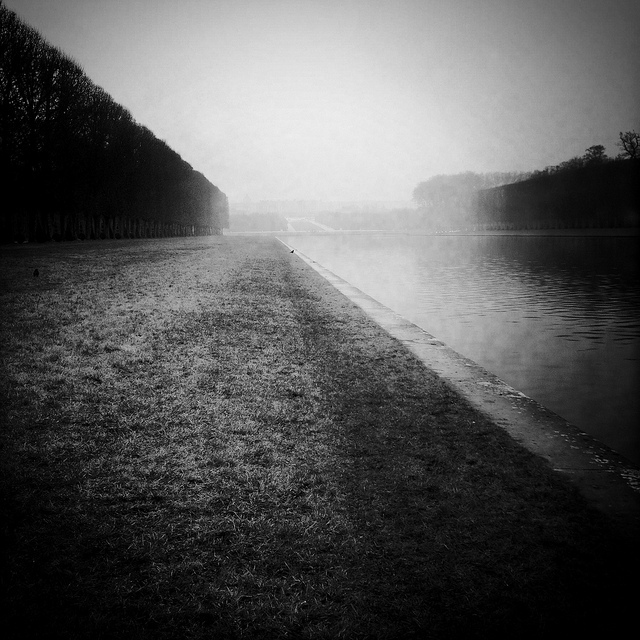 In February 2012, I visited the Palace of Versailles in France, hoping to discover for myself the haunting mystery contained in my favourite book of photographs: Deborah Turbeville’s Unseen Versailles. What I found was a gilded tourist destination with a gift shop full of overpriced trinkets. Disenchanted, I wandered out onto the elevated parterre that overlooks the Palace’s gardens and park. The audacious Grand Canal, sweeping 1500 metres into the distance, took my breath away. Next morning, I got up at 4.30, determined to arrive at the park whilst the mist was still hanging over the water and clinging to the sculpted trees: just the atmosphere for the photographs I wanted. Returning home with a new-found interest in garden photography, I wondered if I might find an inspiring historical garden near Cheltenham, where I live and easily accessible by public transport. Painswick Rococo Garden came to mind. I’d been making occasional visits there since 1989, witnessing its emergence from overgrown jungle to what it is today: the foremost example of English Rococo period garden design. The gardens at Versailles and Painswick have both been described as Rococo in spirit and yet they could not be more different. 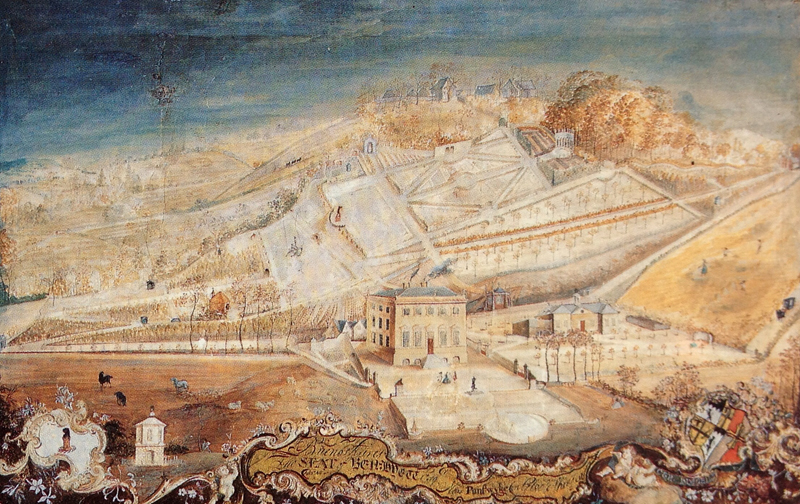 Versailles was laid-out geometrically: the pleasure ground of a monarch. Painswick is a much smaller, middle-class garden, dedicated to pleasure, but also to domesticity. Its layout is a jumble of ideas: a bit of this and a bit of that, tumbling down a steep, grassy slope, rather like one of Fragonard’s lace-clad ladies, loosing her satin slipper along the way. At its center is an ornamental Kitchen Garden, around which lies a network of paths leading to follies, gazebos and woodland dells: locations explicitly designed for amorous liaisons. Unlike their Victorian descendants, the down-to-earth Georgian bourgeoisie didn’t hide their fruit and veg inside high-walled gardens: they clearly regarded their five-a-day as both nourishing and sensual. The voluptuous generosity of Painswick’s plentiful kitchen garden drew me in, as both an allotment gardener, because I’m always interested (and rather envious) to see how things are grown by people who really know what they’re doing, and as a photographer. 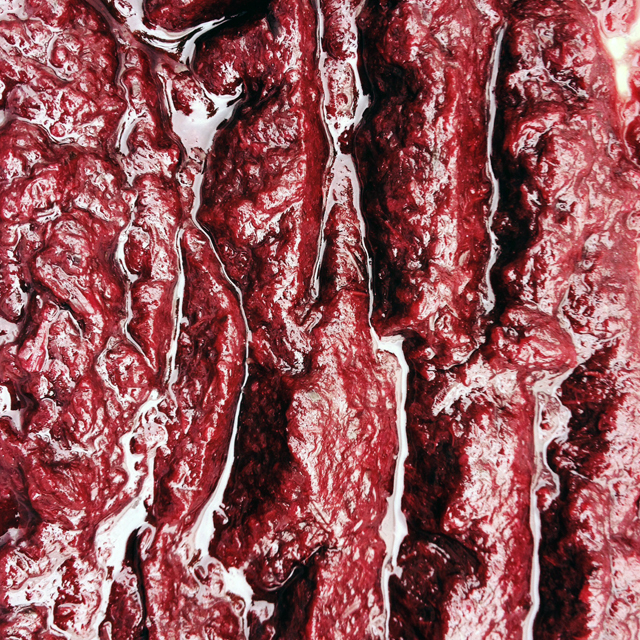 I’d been reading about Anthotypes: photographs printed with the juices extracted from fruits and vegetables. 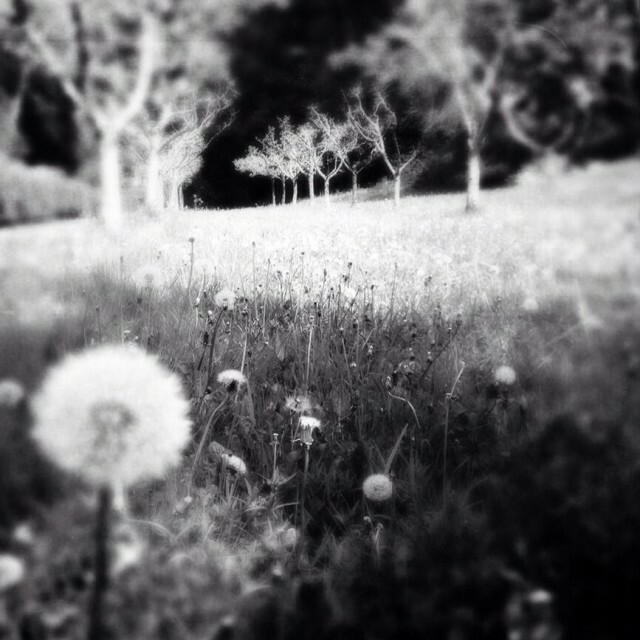 I wondered: what if I were to follow the gardening year at Painswick, transforming photographs taken with my mobile phone into Anthotypes, using the plants grown here? The produce grown in the Rococo Garden is destined for its restaurant. Cookery is a sensual art that’s implicitly generous and ephemeral. We invest time in the preparation of food with the express wish that it be consumed. Furthermore, in the kitchen at Painswick, recipes are seasonal and may be enjoyed for a limited period only. So it’s appropriate that I’m making Anthotypes here. 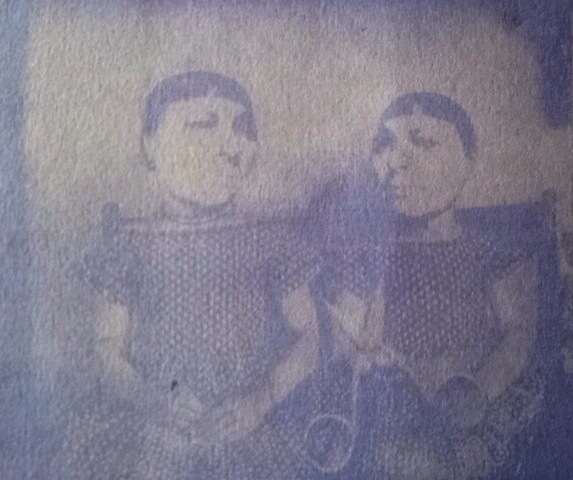 It takes a considerable commitment of time to prepare the ingredients for an Anthotype and “develop” it in the sun (fine weather permitting) and as there is no known way to fix the resulting ghostly image, it will exist for a limited time only, before the sun that created it, consumes it. Every day, millions of images are uploaded from mobile phones to the internet, and many of them depict the food we’re eating. One of my friends has commented that these days, when asked about a memorable restaurant meal, people are more likely to pull out a photo on their phone, than describe how the food tasted and smelt. It could be said that as a mobile Photographer, I’m a fast food addict who is about to join the Slow Food movement. I have no idea what kind of photographer I’ll be by the end of this year. Perhaps I’ll no longer be a photographer: maybe I’ll take up full-time gardening instead, regarding photography as something that I nurtured and enjoyed in just one season of my life: something to be savoured and then returned, with gratitude, to the Universe. If I am to explore the art of Anthotypes, I must embrace the art of letting go. 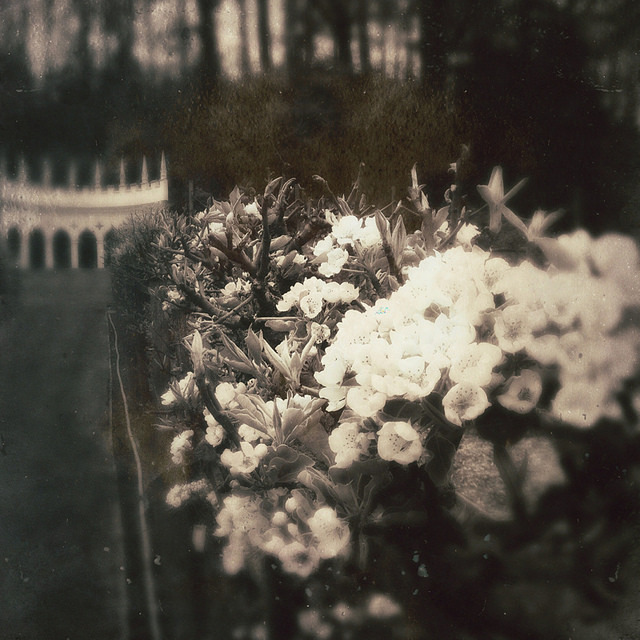 This entry was posted in Uncategorized and tagged A-Type Photographs, Alternative Photographic Processes, Anthotypes, English Historical Gardens, Garden history, Garden Photography, Green Photography, Historical Gardens, Historical Photographic Processes, History of Photography, Hortus Lucis, Lumilyon, Malin Fabbri, Mindful Photography, Nettie Edwards, Painswick, Painswick Rococo Garden, Photographic Philosophy, Rococo Garden, Thomas Robbins, Versailles on May 14, 2014 by lumilyon.